Can mapping water bodies help in attaining food security!! Identification, assessment of current state and potential for rejuvenation is analyzed. This is done to assess available quantity of water and plan water budgeting. Based on volume of water available and topography of the area command area is dynamically mapped every season to plan cropping. Effect of agriculture waste accumulation in water bodies is quantified in season to season basis. We help our partners in understanding water bodies and their surrounding environment using Remote sensing and GIS. This approach not only enables maintaining the lake information but also helps planners and community by providing valuable information like lake water holding capacity, temporal changes in the lake that take place due to the climate and other reasons. We use change detection based on historical data correlation and rule based automation to understand the current state of water bodies. To overcome current challenges in the handling water body information; satellite imagery and smart phones can be deployed in the work-flow. Smartphones enable in capturing location attributes of water bodies and enable geotagging the activities carried in and around them like bund renovation, desilting etc. 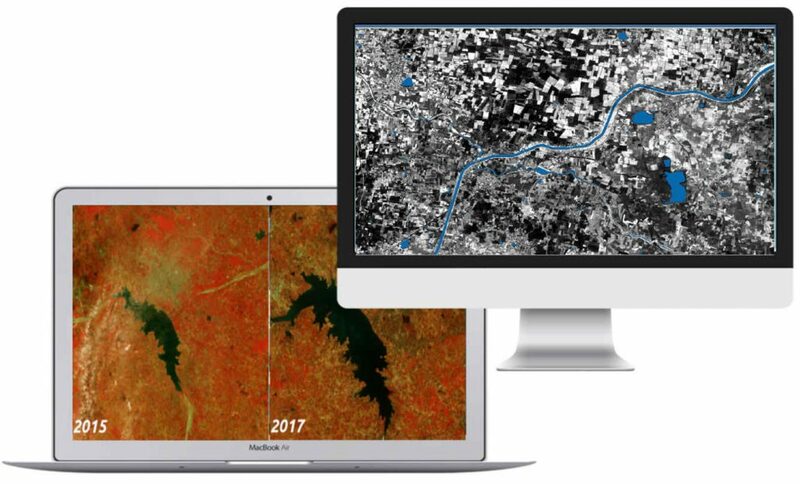 Satellite imagery can be used to generate water body boundaries, estimate holding capacity and also monitor the effect of the regeneration on the command areas. Our approach enables communities to sustainably plan usage of water resources in growing crops so that all stakeholders have better availability of the water resources.